We’re very excited to announce that the collaboration stage of the Treaty Times Thirty project is just beginning. 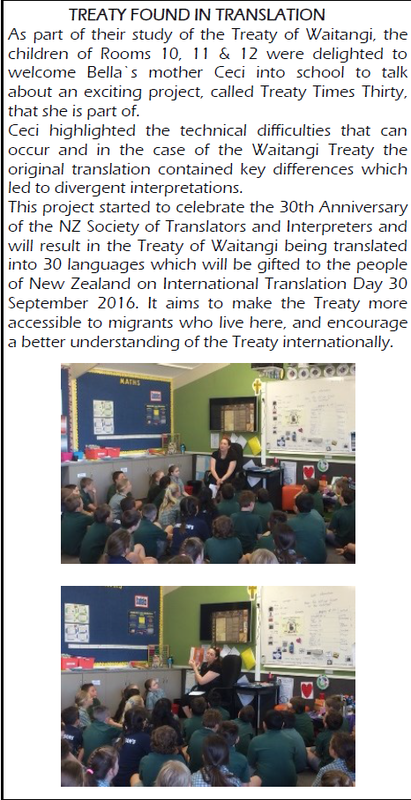 Hi all, this is just a quick update from the Treaty Times Thirty project committee. We’re very pleased that the project is progressing very well, although the translation phase is taking a little longer than first expected! We’re extremely grateful to all of the translators working on the project. It’s great to see that some translators have submitted translations already, as we’re planning to get the review phase underway shortly. The project committee will be meeting soon to finalise the details of the review phase. If you’ve arranged to do a translation for the project, please complete your work and send in your translation so we can keep the momentum going. Thank you so much! Can you help translate the Treaty of Waitangi into one of these languages? Ceci visits a local school to share the project with the children from Rooms 10, 11 & 12. A small group of volunteers has embarked on the task of translating the Treaty of Waitangi into 30 different languages. Click here to read the full article in the Upper Hutt Leader.